↑ Hickman, Christopher (2005). 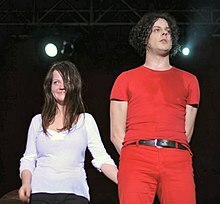 The White Stripes – Get Behind Me Satan FlakMag.com . Retrieved September 27, 2006. ↑ "Elephant - Platinum". British Phonographic Industry. สืบค้นเมื่อ July 24, 2008. ↑ "White Blood Cells - Gold". British Phonographic Industry. สืบค้นเมื่อ July 25, 2008. ↑ "White Stripes awards". Recording Industry Association of America. สืบค้นเมื่อ July 24, 2008. ↑ "Grammy Awards: Best Alternative Music Performance". RockontheNet. สืบค้นเมื่อ July 24, 2008. ↑ ""Announcement of Split"". thirdmanrecords.com. สืบค้นเมื่อ February 2, 2011. หน้านี้แก้ไขล่าสุดเมื่อวันที่ 31 มีนาคม 2559 เวลา 19:36 น.